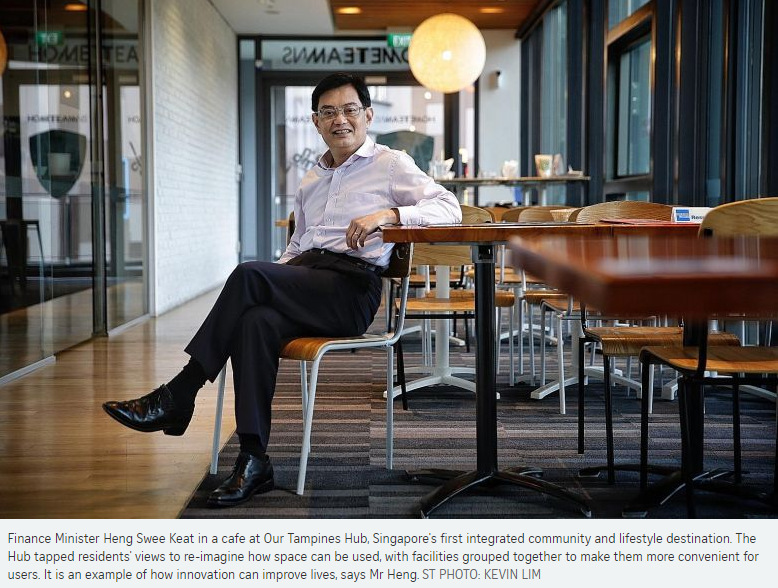 Finance Minister Heng Swee Keat remembers how, as a young police officer, he encountered a traffic light that was not working and had to get out of his patrol car to marshal traffic. There he was, smack in the middle of Lower Delta Road with honking cars whizzing by. He had to impose some order quickly. "You have to do some gut feel and say, 'OK, enough cars have passed, let me now not cause a hold-up'," he recalls. That gut feeling also guided him when, as commander of Jurong Police Division later, he and his men had to raid construction sites to sniff out illegal immigrants. Police operations involve split-second decision-making. "You decide what you do there and then. Arrest, not arrest. Shoot, don't shoot." He says all this in his trademark mild-mannered way, but his eyes are serious. It occurs to me suddenly that he's someone who would not hesitate to do what's necessary. The man considered to be one of the front runners to be Singapore's next prime minister has a reputation for being decent and likeable. 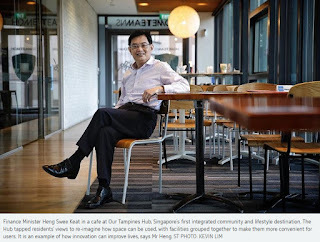 Up close, Mr Heng, 57, is indeed amiable and polite. He is soft-spoken, speaks in clear, complete paragraphs and has an engaging way of relating anecdotes. He uses the word "nice" a lot and has a calming presence. Behind this modest, genial front, though, is an impressive curriculum vitae. In his career that spans 30-plus years, he has been a police officer, principal private secretary to the late Mr Lee Kuan Yew, senior civil servant, head of Singapore's central bank and education minister, and is now Finance Minister. His wealth of experience - both in policymaking and hands-on operations - means he is comfortable with both police constables and G-20 ministers, students and central bankers. And that mild manner, I discover during our 2½-hour lunch, also belies a steely resolve and a strong sense of fair play. HE HAS chosen to meet at Our Tampines Hub in his Tampines GRC ward. It is my first visit to the Hub, which opened last year and is billed as Singapore's first integrated community and lifestyle destination. He has arranged for me to get a tour prior to our lunch. It has left me envious and open-mouthed with awe. The Hub is basically a community centre on steroids. Across a massive interconnected space, there's a football/rugby stadium with 5,000 seats, the five-storey Tampines Regional Library, an arts theatre, six swimming pools (including an indoor pool), a 1km jogging track, many other sports courts and a bowling alley. There's also a hawker centre and 24-hour supermarket, food outlets and nooks for students to study. One floor is for health and wellness services. A one-stop centre houses several government agencies. There's even a snazzy recycling area where food waste from the Hub is converted to compost which is used in the eco-community garden on the roof. Vegetables there are sent downstairs to the cooking classes and dishes shared with residents. The recycling effort has cut down the number of trucks needed to cart away food waste, in turn helping traffic flow in the area. The Hub is impressive, I tell him as we settle down for lunch at I Am...@HomeTeamNSTampines, a halal cafe on the third floor. I wish I had something like that in my neighbourhood, I add. "Everyone is welcome to use it," he smiles. The Hub, he says, is an example of how innovation - a key theme in his speeches - can improve lives. It also shows how innovation applies not just to the economy and industry but also to social spaces. He relates how a middle-aged resident told him that the Hub has changed her mother's life. The wheelchair-bound elderly woman previously did not want to leave the house. Now, she is eager to visit the Hub because she loves its vibrancy and how wheelchair-friendly it is. He always tells his civil service colleagues that it's important to see how policies translate into improving lives, he adds. The waiter is waiting to take our orders. We both get the Cajun spicy chicken linguine and are persuaded to start with some cheese bread. He gets a cafe mocha and I get tea. THE Singapore of today is a far cry from the one he grew up in. He was born in 1961 and when I ask which part, he says "the part with gangsters". Geylang, I suggest. Redhill, he replies. There were several hundred homes in the kampung, which was "a rather rough neighbourhood". But he has good memories too. "Our house had quite a lot of nice vegetation and I used to spend time on the trees, so it was quite fun. And then we had chickens and pigs." He's Teochew but speaks Hokkien more fluently. I ask him about rumours that his father was the late comedian Wang Sa of Ah Pui-Ah San fame. He smiles and says: "I'm very amused by that. Many people have asked me." So is it true? "If they associate me with having some good humour, I don't mind. I'll take it with some good humour," is all he will say. He does not want to reveal too much about his family, beyond that it wasn't very large. When he entered politics, he made an agreement with them and wants to keep to it. "I think the family deserves some privacy and their own space. I mean, I would like to know you as Sumiko and not you as the daughter of somebody." He attended a primary school that no longer exists and went to Raffles Institution. He loved his time in RI where he was in the Interact Club, did the school magazine, tinkered with electronics and played volleyball, "but I don't think I had great dexterity". A schoolmate remembers him as being very well liked, genial, serious and hardworking. His nickname was Sweat, not because he was sweaty but because it was a combination of his name Swee Keat and "symbolic of his industrious nature", says the schoolmate. "He's that kind of a sweet guy that that's the most fun people would poke at him. He continues to respond to that today." After A levels at RI, he got a police scholarship to do economics at Cambridge. Going to Britain was his first trip overseas and that was another happy phase. He spent holidays in Europe and had stints with the Surrey Police and London Metropolitan Police. Cambridge was where he met his wife, fellow Singaporean Chang Hwee Nee, a President's Scholar. "I was at Christ's College and she was at Jesus College and our colleges were next to one another. I always had the privilege of escorting her back from student events." They were film buffs in their younger days. She is now chief executive officer of the National Heritage Board and they have a daughter and a son in their 20s. He enjoyed his 15 years in the police. Among other things, he was heavily involved in conceptualising and implementing community policing and spent five years in the Criminal Investigation Department. He also attended the nine-month Command and Staff Course conducted by the Singapore Armed Forces. His last rank was assistant commissioner. In 1997, he moved to the Administrative Service. He did a spell in the Education Ministry, was permanent secretary at the Ministry of Trade and Industry, and managing director of the Monetary Authority of Singapore (MAS). For three years in the late 1990s, he was principal private secretary to then Senior Minister Lee Kuan Yew. He describes this as the highlight of his public service career. He learnt a lot from how Mr Lee interacted with world leaders and saw how he viewed thorny issues like the 1997 Asian financial crisis. It was "a good process of osmosis". Mr Lee once described him as "the best principal private secretary I ever had". The insights he got from Mr Lee came in handy a decade later when the global financial crisis broke while he was at MAS. Singapore rode out the crisis. His years in public service have taught him that there are two types of decision-making. There are split-second decisions, like when he was doing front-line police work and also when he was Education Minister and Singapore students on Mount Kinabalu were hit by the Sabah earthquake. He had to decide very quickly what to do. Then there are other decisions - like abolishing PSLE T-scores in school - that need more time, greater thought and consultation. He has found that when a decision needs to be implemented through many layers, the more everyone along the line is convinced that it is the right decision to take, the easier and faster the implementation, and the faster the results. Planning is really part of implementation in such cases. HE ENTERED politics in 2011, becoming education minister and then Finance Minister in 2015. In May 2016 during a Cabinet meeting, he suffered a brain aneurysm. He has since fully recovered from what he himself describes as a close shave. Miraculous is how some have described his comeback. I ask if the episode changed him. He chooses to answer by first thanking his Cabinet colleagues who helped him, the ambulance crew, doctors, nurses and all the well-wishers. He mentions his gratitude several times. His doctors have given him a very good prognosis and he has resumed all grassroots work and long-haul travelling. "Has it changed me? Well, I think it gave me perspective on what are the things that are important. So I must say I'm very grateful." And what might the important things be? He smiles, places his right hand over his heart and says simply: "Well, that is something which shall remain within us." I wonder if he has a religion. No, he says, although he was raised a Buddhist and went to temples. But he adds: "When I was down, I was very touched by the number of different people with different religions who prayed for me. And every time I see them, they say, 'Oh, Mr Heng, my prayer group prayed for you.' I'm very, very grateful. "And I must say that when you think about our lives, the life on earth, it's wonderful. There are many things that we don't understand. And do I believe that there is a supreme being that is designing all this? Yah, a good chance, and we must keep an open mind about this." He gives off such positive vibes that I wonder if he has a temper. Yes, he says, he does lose his temper. He recalls how a couple once came to his Meet-the-People Session with their young daughter. The wife insisted that he, then the Education Minister, change the secondary school the girl had been posted to. He explained why this wasn't possible but the woman got angry, grabbed her daughter, shouted and stormed off. Annoyed, he called the couple back while his volunteers looked after the daughter. He told the woman that it didn't matter that he was the MP or anyone, but for her to have an outburst like that set a bad example for the daughter. She was also making it hard for the girl to adjust to the new school. It would also be wrong for him to direct his ministry to accede to the unreasonable request just because they were his constituents, he told her. "That would be wrong in principle. We must never do that in Singapore... If I felt that our policy was wrong, I would be prepared to review it. But from what I could see, it was the right thing to do." I suppose you lost a vote that night, I say. "I don't know, but I don't think we should do the wrong thing," he replies. "And I trust that Singaporeans at the end of the day will understand what is good for the country, and that if you do lose one or two votes because you have to do the right thing, I think we must be prepared to do that. Otherwise how do you govern? We will lose any moral authority to do it." IN THE last few months, his name has been mentioned as a possible choice for the next PM. Does the speculation get tiresome, I ask. He views the chatter in a positive light. He says it is encouraging that Singaporeans regard political leadership as important to the country's long-term future , "and so I'm very comforted by that". Does he want to be PM? "When I entered politics, I did not have in mind a particular position," he says. He was just grateful to have benefited from the system and wanted to do his bit to "at the very least maintain this system or, better still, strengthen" it. Would he support whoever is PM if it's not him? "Yes," he says. "I think the person who is most suited for this, every one of us would give their full support because, after all, this is really a matter about our young nation, not a matter about our personal ambitions. "We must see it as much larger than ourselves." He believes that with society becoming more diverse, good leadership and governance must also involve more leadership at all levels of society, yet having a common sense of purpose on where to take Singapore. He has been generous with his time and we've come to the end of a long lunch. The table we are at overlooks the Hub's stadium. A women's football match between two junior college teams has started. A place like the Hub where teenagers can play in such a beautiful, state-of the-art stadium is probably only possible in a wealthy country, I remark. "We are very, very lucky", he says. "And that's why I said that we must continue to grow our economy." As guardian of the country's purse strings at the Finance Ministry - and should there be more responsibilities coming his way - he will be there to help make sure this continues.